Hey, there! I'm sitting here while the babies nap and thought I'd squeeze in a blog post. I've had photos of this look in my drafts folder for a few weeks. Oops. I mean, blogging is more fun than laundry and dishes, right?! Let's keep it quick! I initially wanted to share this look because Chris got me this sweater for Christmas and oh. my. goodness. I love it! It is so cozy, and soft. 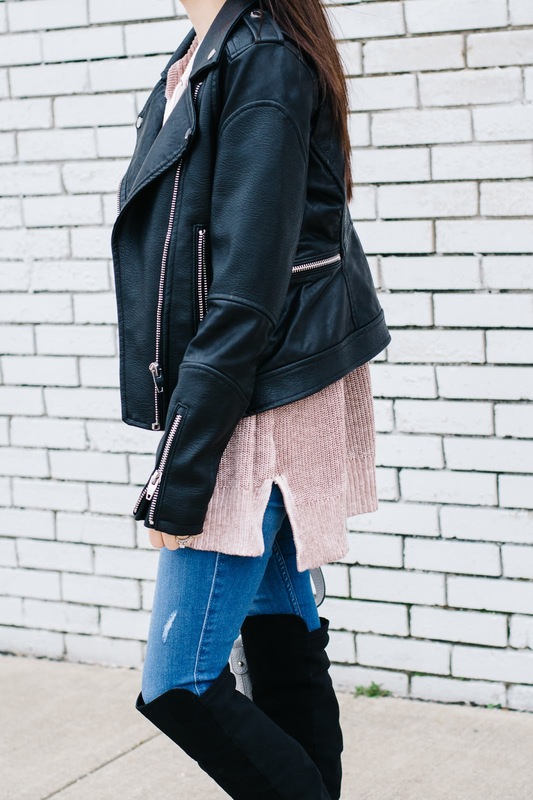 Mostly I wear it with sneakers and joggers, but it was easily paired with jeans and this faux leather jacket for some weekend errands as well. It comes in this pretty mauve color, and also a bluish color. I've been trying to catch it on sale (haven't yet! ), but I think its worth the full price also. It's one of those pieces that you can easily throw on and go, and definitely lounge around in. I have to stop myself from grabbing it every other day... Chris even made a comment about how much I wore it within the first two weeks. Ha! Another piece I love and recommend - my faux leather jacket. I have had this one for two years now (still looks new - great quality! ), and wear it all of the time. A good jacket, especially a statement piece like this one, is always a must. Pair it with a dress, jeans, shorts - whatever... it will instantly add a little bit of edge to any outfit. You can see where I raved about it last year, when I gave you 3 Reasons Why You Need a Faux Leather Jacket. And my love for OTK boots, yep - still the same. Had these bad boys for two years as well, and they are my most worn boot for fall and winter. If you don't own a pair, think about snagging one at the end of season sale. They are currently under $70 (still a great price for boots) + if you spend over $29 today you also get a free bluetooth speaker with code: SOUNDON. It's the small things. Happy Monday!